A typical preserved traction engine: 1909 Burrell 6 nhp general purpose engine, at Great Dorset Steam Fair in 2018. A traction engine is a self-propelled steam engine used to move heavy loads on roads, plough ground or to provide power at a chosen location. The name derives from the Latin tractus, meaning 'drawn', since the prime function of any traction engine is to draw a load behind it. They are sometimes called road locomotives to distinguish them from railway locomotives – that is, steam engines that run on rails. Traction engines tend to be large, robust and powerful, but heavy, slow, and difficult to manoeuvre. Nevertheless, they revolutionized agriculture and road haulage at a time when the only alternative prime mover was the draught horse. They became popular in industrialised countries from around 1850, when the first self-propelled portable steam engines for agricultural use were developed. Production continued well into the early part of the 20th century, when competition from internal combustion engine-powered tractors saw them fall out of favour, although some continued in commercial use in the United Kingdom well into the 1950s and later. All types of traction engines have now been superseded in commercial use. However, several thousand examples have been preserved worldwide, many in working order. Steam fairs are held throughout the year in the United Kingdom, and in other countries, where visitors can experience working traction engines at close hand. Traction engines were cumbersome and ill-suited to crossing soft or heavy ground, so their agricultural use was usually either "on the belt" – powering farm machinery by means of a continuous leather belt driven by the flywheel – or in pairs, dragging an implement on a cable from one side of a field to another. However, where soil conditions permitted, direct hauling of implements ("off the drawbar") was preferred – in America, this led to the divergent development of the steam tractor. Limits of technical knowledge and manufacturing technology meant that practicable road vehicles, powered by steam, did not start to appear until the early years of the 19th century. The traction engine, in the form recognisable today, was developed from an experiment in 1859 when Thomas Aveling modified a Clayton & Shuttleworth portable engine, which had to be hauled from job to job by horses, into a self-propelled one. The alteration was made by fitting a long driving chain between the crankshaft and the rear axle. Thomas Aveling is regarded as "the father of the traction engine". Other influences were existing vehicles which were the first to be referred to as traction engines such as the Boydell engines manufactured by various companies and those developed for road haulage by Bray. The first half of the 1860s was a period of great experimentation but by the end of the decade the standard form of the traction engine had evolved and would change little over the next sixty years. Until the quality of roads improved there was little demand for faster vehicles and engines were geared accordingly to cope with their use on rough roads and farm tracks. Right through to the first decades of the twentieth century, manufacturers continued to seek a solution to realise the economic benefits of direct-pull ploughing and, particularly in North America, this led to the American development of the steam tractor. British companies such as Mann's and Garrett developed potentially viable direct ploughing engines, however market conditions were against them and they failed to gain widespread popularity. These market conditions arose in the wake of the First World War when there was a glut of surplus equipment available as a result of British Government policy. Large numbers of Fowler ploughing engines had been constructed in order to increase the land under tillage during the war and many new light Fordson F tractors had been imported from 1917 onwards. Road steam disappeared through restrictions and charges that drove up their operating costs. Through 1921, steam tractors had demonstrated clear economic advantages over horse power for heavy hauling and short journeys. However, petrol lorries were starting to show better efficiency and could be purchased cheaply as war surplus; on a busy route a 3-ton petrol lorry could save about £100 per month compared to its steam equivalent, in spite of restrictive speed limits, and relatively high fuel prices and maintenance costs. Throughout the 1920s and 1930s there were tighter restrictions on road steam haulage, including speed, smoke and vapour limits and a 'wetted tax', where the tax due was proportional to the size of the wetted area of the boiler; this made steam engines less competitive against domestically produced internal combustion engined units (although imports were subject to taxes of up to 33%). As a result of the Salter Report on road funding, an 'axle weight tax' was introduced in 1933 in order to charge commercial motor vehicles more for the costs of maintaining the road system and to do away with the perception that the free use of roads was subsidising the competitors of rail freight. The tax was payable by all road hauliers in proportion to the axle load and was particularly restrictive on steam propulsion, which was heavier than its petrol equivalent. Initially, imported oil was taxed much more than British-produced coal, but in 1934 Oliver Stanley, the Minister for Transport, reduced taxes on fuel oils while raising the Road Fund charge on road locomotives to £100 per year, provoking protests by engine manufacturers, hauliers, showmen and the coal industry. This was at a time of high unemployment in the mining industry, when the steam haulage business represented a market of 950,000 tons of coal annually. The tax was devastating to the businesses of heavy hauliers and showmen and precipitated the scrapping of many engines. The last new UK-built traction engines were constructed during the 1930s, although many continued in commercial use for many years while there remained experienced enginemen available to drive them. From the 1950s, the 'preservation movement' started to build up as enthusiasts realised that traction engines were in danger of dying out. Many of the remaining engines were bought by enthusiasts, and restored to working order. Traction engine rallies began, initially as races between engine owners and their charges, later developing into the significant tourist attractions that take place in many locations each year. It has been estimated[by whom?] that over two thousand traction engines have been preserved. Although the first traction engines employed a chain drive, it is more typical for large gears to be used to transfer the drive from the crankshaft to the rear axle. The machines typically have two large powered wheels at the back and two smaller wheels for steering at the front. However, some traction engines used a four-wheel-drive variation, and some experimented with an early form of caterpillar track. Traction engines saw commercial use in a variety of roles between the mid-nineteenth and mid-twentieth centuries. Each role required a machine with a different set of characteristics, and the traction engine evolved into a number of different types to suit these different roles. "Big Lizzie", a purpose built tractor with two trailers, designed and built by Frank Bottrill using the Dreadnaught wheel which he designed. When built "Big Lizzie" was the biggest tractor in Australia and thought to be the biggest in the world, at 34 feet high by 18 feet wide, and weighing 45 tons. The most common form in the countryside. They were used for hauling and as a stationary power source. Even when farmers did not own such a machine they would rely upon it from time to time. Many farms would use draught horses throughout the year, but during the harvest, threshing contractors would travel from farm to farm hauling the threshing machine which would be set up in the field and powered from the engine – a good example of the moveable stationary engine. Favourable soil conditions meant that US traction engines usually pulled their ploughs behind them, thereby eliminating the complexities of providing a cable drum and extra gearing, hence simplifying maintenance. American traction engines were manufactured in a variety of sizes, with the 6 nhp Russell being the smallest commercially made, and the large engines made by Russell, Case, and Reeves being the largest. A John Fowler & Co. Ploughing Engine - the winding drum is mounted below the boiler (the 'drum' on the side is actually a hose for refilling the water tank). A lockable tool box may be seen on the front axle; the 'spud tray' would be mounted in the same way, behind the axle. A distinct form of traction engine, characterised by the provision of a large diameter winding drum driven by separate gearing from the steam engine. Onto the drum a long length of wire rope was wound, which was used to haul an implement, such as a plough, across a field, while the engine remained on the headland. This minimized the area of land subject to soil compaction. The winding drum was either mounted horizontally (below the boiler), vertically (to one side), or even concentrically, so that it encircled the boiler. The majority were underslung (horizontal), however, and necessitated the use of an extra-long boiler to allow enough space for the drum to fit between the front and back wheels. These designs were the largest and longest traction engines to be built. Mostly the ploughing engines worked in pairs, one on each side of the field, with the rope from each machine fastened to the implement to be hauled. The two drivers communicated by signals using the engine whistles. A variety of implements were constructed for use with ploughing engines. The most common were the balance plough and the cultivator - ploughing and cultivating being the most physically demanding jobs to do on an arable farm. Other implements could include a mole drainer, used to create an underground drainage channel or pipe, or a dredger bucket for dredging rivers or moats. The engines were frequently provided with a 'spud tray' on the front axle, to store the 'spuds' which would be fitted to the wheels when travelling across claggy ground. The man credited with the invention of the ploughing engine, in the mid-nineteenth century, was John Fowler, an English agricultural engineer and inventor. However a ploughing engine, devised by Peter, Lord Willoughby de Eresby and his bailiff George Gordon Scott, and constructed at Swindon Works, was exhibited at the Great Exhibition of 1851 in London, some years before Fowler's system appeared. Lord Willoughby had indicated that his design could be copied freely, and Fowler had visited Grimsthorpe Castle, the estate where the ploughing engines were deployed. Ploughing engines were rare in the US; ploughs were usually hauled directly by an agricultural engine or steam tractor. In North America, the term steam tractor usually refers to a type of agricultural tractor powered by a steam engine, used extensively in the late 19th and early 20th centuries. 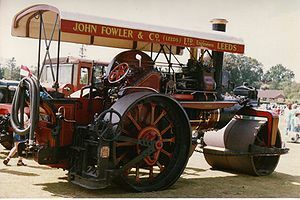 In Great Britain, the term steam tractor is more usually applied to the smallest models of traction engine – typically those weighing below five tons for the engine to be single manned (anything above had to be manned by at least two people; a driver and steersman); used for hauling small loads on public roads. Although known as light steam tractors, these engines are generally just smaller versions of the road locomotive. They were popular in the timber trade in the UK, although variations were also designed for general light road haulage and showman's use. The most popular of these designs was probably the Garrett 4CD, meaning 4 nominal horse power Compound. Designed for haulage of heavy loads on public highways, it was common for two or even three to be coupled together to allow heavier loads to be handled. The characteristic features of these engines are very large rear driving wheels fitted with solid rubber tyres, three-speed gearing (most traction engine types have only two gears), rear suspension, and belly tanks to provide a greater range between the stops needed to replenish water. All these features are to improve the ride and performance of the engine, which were used for journeys of hundreds of miles. Most road locomotives are fitted with a winch drum on the back axle. This can be used by removing the driving pins from the rear wheels, allowing the drive train to power the winch drum instead of the wheels. James Boydell worked with the British steam traction engine manufacturer Charles Burrell & Sons to produce road haulage engines from 1856 that used his Dreadnaught Wheels which were particularly suited to bad roads or off road use. A number of road locomotives are fitted with a crane boom on the front. The boom pivot is mounted on the front axle assembly and a small winch is mounted on an extension to the smokebox in front of the chimney, the cable passing over a sheave at the top of the boom arm. The winch is powered by bevel gears on a shaft driven directly from the engine, with some form of clutch providing raise/lower control. These road locomotives can be used to load a trailer as well as to haul it to a new location. They are often referred to as 'crane engines'. A particularly distinctive form of road locomotive was the showman's engine. These were operated by travelling showmen both to tow fairground equipment and to power it when set up, either directly or by running a generator. These could be highly decorated and formed part of the spectacle of the fair. Some were fitted with a small crane that could be used when assembling the ride. Related to the steam traction engine, the steam roller was used for road building and flattening ground. Typically designed with a single heavy roller (in practice, usually a pair of adjacent rollers) replacing the front wheels and axle, and smooth rear wheels without strakes[clarification needed]. Some traction engines were designed to be convertible: the same basic machine could be fitted with either standard ('treaded' or tyred[clarify]) road wheels, or else smooth rolls – the changeover between the two being achieved in less than half a day. A number of other steam-powered vehicles share design features with the traction engine, usually because the same technology was re-used in a new application. A portable engine is a type of self-contained steam engine and boiler combination that may be moved from site to site. Although bearing a strong family resemblance, in both appearance and (stationary) operation, the portable engine is not classed as a traction engine as it is not self-propelled. However, it is included in this list because the traction engine is a direct descendant. A steam wagon is a steam-powered road vehicle for carrying freight. It was the earliest form of lorry (truck) and came in two basic forms: overtype and undertype – the distinction being the position of the engine relative to the boiler. Among the firms that specialized in them in the 1900s was the short-lived Invicta Works of Maidstone, owned by Jesse Ellis. The overtype had a steam engine mounted on top of a fire-tube boiler, in a similar manner to a traction engine. The front of an overtype steam wagon bears a close family resemblance to traction engines, and manufacturers who made both may well have been able to use some common parts. The undertype had the steam engine mounted under the boiler, usually between the frames of the chassis. The boiler was usually mounted well forward and was often a vertical and/or water tube type. Steam wagons were the dominant form of powered road traction for commercial haulage in the early part of the twentieth century, although they were a largely British phenomenon, with few manufacturers outside Great Britain. Competition from internal-combustion-powered vehicles and adverse legislation meant that few remained in commercial use beyond the Second World War. An Aveling and Porter traction engine-based railway locomotive, as used by Holborough cement co.
Several traction engine builders (such as Aveling and Porter and Fowler) built light railway locomotives based on their traction engines. In their crudest form these simply had flanged steel wheels to enable them to run on rails. More sophisticated models had the boiler and engine mounted on a chassis which carried railway-wagon style axles. The rear axle was driven from the engine by gear or chain-drive. These unusual locomotives were sold to small industries for use in shunting and marshalling duties, although they also found favour with engineering firms engaged in the construction of mainline railways for hauling men, equipment and materials over the partly constructed line. spud or lug – strip of angled metal that could be bolted to the driving wheels to provide greater traction on soft or heavy ground. Spuds were often required on ploughing engines when moving across farmland. strake – name for the diagonal strips cast into or rivetted onto the wheel rims to provide traction on unmade ground (similar to the tread on a pneumatic tyre). Nominal horse power– nhp is the typical way that traction engines are rated. However, it has long been accepted that nominal horse power greatly understates the actual power of the engine. There are many ways to estimate the actual horse power but none of them gives an accurate answer, for example, a 4 nhp engine is said to be approximately 36 hp (27 kW); however a 4 nhp engine can easily pull a laden 8-wheeler lorry while a diesel engine of 36 hp (27 kW) cannot. Thus, many[who?] have resigned themselves that this debate will never be settled and, while nominal horsepower gives a convenient way of rating traction engines, it may never be converted accurately into diesel HP. Two operators seen after taking part in a parade with their engine, 'Earl Douglas' at Otley carnival in Yorkshire, England. Although no longer used commercially, traction engines of all types continue to be maintained and preserved by enthusiastic individuals and are frequently exhibited at agricultural shows in Europe (particularly the UK), Canada and the United States. They are often a main attraction in a live steam festival (see List of steam fairs). Model traction engines, powered by steam, are manufactured by several companies, notably Mamod and Wilesco. Larger scale model engines are popular subjects for model engineers to construct, either as a supplied kit of parts, or machined from raw materials. The 1962 film The Iron Maiden featured a showman's engine as the film's star, along with many others, at the annual rally at Woburn Abbey. In the 2004 film Tremors 4: The Legend Begins, the people of Rejection, Nevada had a traction engine and were proud of it. When they were forced to abandon their town, the engine was going to be used to pull two wagons. During the final battle, two of the characters fired their guns from on the traction engine; and the traction engine was used to kill the last Grabiod by ramming it with such force against the front of the engine, it was decapitated. Trevor the Traction Engine is one of the non-railway characters featured in The Railway Series of children's books by the Rev. W. Awdry. Appearing in several of the books, the traction engine was originally 'saved from scrap' by The Vicar of Wellsworth with the help of Edward the Blue Engine. Trevor has also appeared in a number of episodes in the TV spin-off Thomas the Tank Engine and Friends. Another traction engine, Fergus the Railway Traction Engine also appears in Thomas & Friends, but unlike Trevor, Fergus runs on rails instead of roads. Theo, from Journey beyond Sodor is based on a Brill Tramway No. 1. In the book Gumdrop and The Farmer's Friend, by Val Biro, the vintage motor-car Gumdrop is rescued from a snowy ditch by "The Farmer's Friend", a traction engine belonging to a local farmer. Some months later, the two vehicles are instrumental in thwarting a pair of car thieves. The end-papers of the book include a simplified cut-away drawing of the traction engine: a single-cylinder, 6 nhp Fowler light tractor, built in 1903. Traction engines for road haulage feature prominently in Keith Roberts' alternate-history novel Pavane. Fred Dibnah of Bolton, England was known as a National Institution in Great Britain for the conservation of old traction engines and other steam engines. His television series, Fred Dibnah's Made in Britain, shows him touring the United Kingdom in his rebuilt, 10 ton traction engine. In the television play Threads, depicting the consequences of nuclear war in the United Kingdom, traction engines come back into use as petrol becomes unavailable. ^ Bonnett, Harold (1975). Discovering Traction Engines. Shire Publications Ltd. p. 5. ISBN 0-85263-318-1. ^ "The Hornsby Steam Crawler". (or 'Chain Tractor'). Retrieved 16 September 2008. ^ William Fletcher (1891). "Charles Burrell and Sons: Road Locomotive". Extract from Steam Locomotion on Common Roads by William Fletcher. Published 1891. Wikimedia Commons has media related to Traction engines. Covers mainly-US traction engines and steam tractors, threshing machines and steam-powered agricultural machinery. Interactive diagram of a traction engine showing major components. This page was last edited on 28 February 2019, at 14:53 (UTC).